Welded leg stands of galvalume tubing on 6 ft. spacing – 2 per bench. Cross members of galvalume tubing on 2 ft. spacing – 2 per bench. 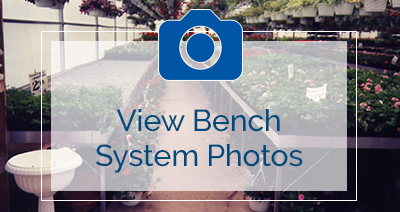 Aluminum bench rail with 1.5″ deck lip comes complete with slip fit corners and rail splices. Diagonal braces and clamps – 4 per bench. All required fasteners and assembly instructions. Available in standard size of 4′ wide x 8′ long. Welded leg stands of galvalume tubing for placement on 6 ft spacing. Flat bottom mounting brackets or anchor posts for setting in concrete. Cross members of galvalume tubing for placement on 2 ft spacing. 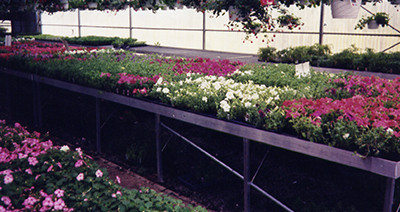 Aluminum bench rail is available flush or with 1.5″ deck lip that is complete with slip fit corners and splices. Diagonal braces – 4 per bench. Available in standard widths of 3, 4, 5, and 6 ft by length required. Custom widths available on request. Welded leg stands of galvalume tubing for placement on 6 ft. spacing. Cross members of galvalume tubing for placement on 2 ft. spacing. Horizontal let stand braces – 2 runs per bench. Roller pipes 1.5″ rd. – 2 runs per bench. All required fasteners and roller handles. 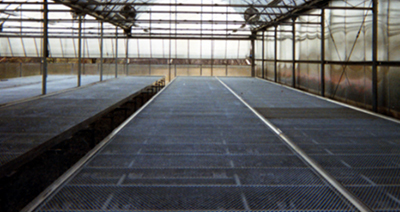 Mesh decking of heavy duty 13 gauge galvanized metal. 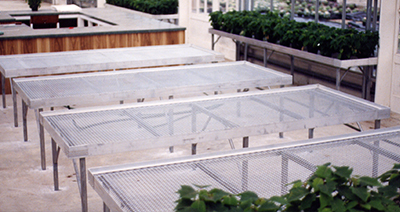 Open weave mesh decking prevents water from puddling as well as allowing for good circulation of air. Fabricated with threaded adjuster studs for each leg stand allowing bench decks to be raised or lowered while still loaded with product.